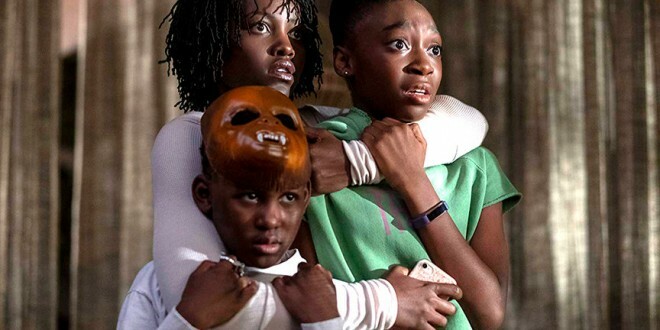 Absolutely nothing is as it appears in this “doppelganger” thriller, commencing with six-year-old “Adelaide” (mesmerizing, doe-eyed Madison Curry) wandering into a fun house at a neighborhood carnival; shivering encounter with her clone, leaves her irrevocably altered; jump to present day and adult Adelaide (outstanding, haunting depiction by Lupita Nyong’o) and her husband “Gabe” (naturally naïve, wholesome Winston Duke), daughter “Zora” (lithesome Shahadi Wright Joseph), son “Jason” (winsome Evan Alex) journey back to the evocative childhood location of her initial introduction to her carbon copy. The actors superbly play dual roles. My reviews to do shed spoilers but “Us” is fraught with metaphors: religious, pervasive references to Jeremiah 11:11, “Therefore saith the Lord, Behold I will bring evil upon them, which they shall not be able to escape; and though they shall cry unto me, I will not hearken unto them”; biological, technological advancements invade the scenario; underground tunnels, miles of them are of major significance to writer/director Jordan Peele; his fecund imagination allows viewers to meander in its labyrinth of inventiveness for the film’s duration. “Us” is not for the faint of heart or nerves, but for those clamoring for intrigue, titillation, this film sinks its relentless, horrific jaws, ransoming one’s concentration, long after the final enthralling, exhilarating, electrifying moment.